For Jack Link's Major League Fishing pro Mike McClelland, fishing in the fall can be a grand experience. Especially – if you'll pardon the pun – when he's fishing a stickbait on northeastern Oklahoma's Grand Lake, a water body that is to some degree the northwestern Arkansas resident's home water. Wait a minute, Mike, a stickbait in the fall? Aren't jerkbaits a traditional springtime lure? 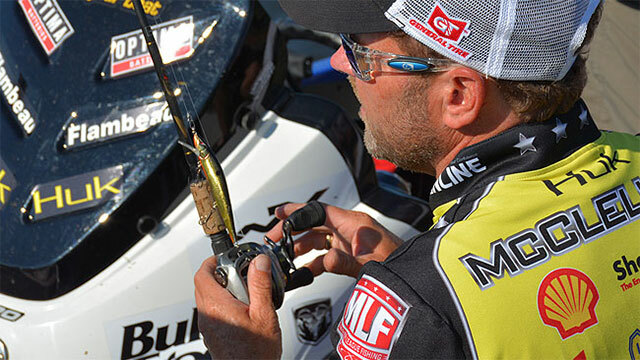 "There's no doubt about it, a lot of people look at a stickbait as being a pre-spawn slow moving bait," said McClelland. "It's an early season bait in a lot of people's eyes." But that's a mistake in McClelland's mind, especially when the leaves are changing colors and pigskins are in the air. "It's always been one of those baits that I turn to in the fall," said McClelland, who has had great autumn success with the bait on Grand Lake, site of the 2016 Bassmaster Classic. Why? Because the bait – which has a profile that resembles a threadfin shad, the primary late year forage fish on many southern lakes – makes noise, provides a good flash as it works through an area and proves to be just too tantalizing when an angler stops it or slows it down.